We take a 360° approach to learning Excel 2016 with demo videos for step-by-step guide, whiteboard videos for easy understanding of concepts, multiple interview questions, best practices, cool tricks and common errors to master the application. Our bonus lessons in the form of shortcut keys, charts and tables makes summarizing easy as a pie. And as a cherry on that pie you get a certificate in Excel 2016 from us! At the end of this course, you are all ready to get yourself certified from Microsoft and call yourself a ‘Microsoft Office Specialist’ in Excel 2016!! 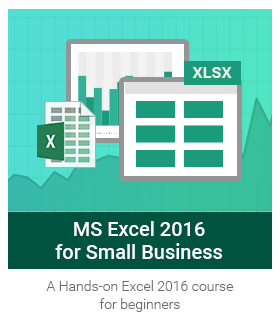 Master Excel 2016 with 7 power-packed levels. Get comfortable with creating workbooks and worksheets. Learn how to add, copy, move, rename and delete worksheets. Understand the basics of rows, columns, cells like inserting and deleting them and modifying the sizes. Our additional learning in this level includes tricks like changing tab color, hiding/unhiding worksheets, adding multiple rows/columns at a time, inserting multiple worksheets at a time; best practice info on creating spreadsheet design and interview questions on ribbon and large text accommodation in Excel. Don’t miss the summaries on common Excel data formats and shortcuts related to the topics learned in this level. Unleash the real power of Excel by creating series and ranges. We give you a step by step guide to using numerical, string, logical and date functions. Learn various methods to manipulate data using these functions and operators. Our add-ins in this level include interview question on name box, best practice methods on using cell references in formulas and how using multiple simple formulas is better than using a single complex formula. Don’t miss the info on how to avoid errors in functions and formulas. We make learning easy with summaries on commonly used Excel functions, order of operations and relevant shortcut keys. Learn some tricks along the way on using flash fill and autofill. Learn how to make your data readable by using formatting features in Excel like font, font style, size, text color, fill color, indentation, alignment, orientation, borders and effects. We teach how to save time in formatting by giving you a step by step guide on conditional formatting, cell styles and format painter. Explore how to create, modify, duplicate, rename and delete cell styles. Add more sense to your functions by learning the difference between absolute and relative cell reference. Our bonus learnings for this level are lessons on protecting the data in Excel, transposing data, hiding data in cells, adding diagonal line in cells and adding leading zeroes in cells. A best practice lesson on how to keep your Excel files consistent with the industry defined formats. We will make searching and modifying in Excel an easy job for you with Find, Replace and Goto features and its numerous search and format options. Organise your data in Excel using sort and filter. Restrict and validate data entry in Excel using data validation, validation circles, error alerts and messages. Make navigating within the workbook easy by learning how to create, edit and delete hyperlinks. Our bonus lessons of this level will make you a master in using, creating, editing, customizing and deleting comments. Some more add-ins on the most useful Vlookup function, using wildcards, generating unique and random values and using speak cells. Learn how to avoid errors while using sort and filter together and how to avoid dead links. Manage viewing data in excel using views, customize data view using gridlines, ruler, panes, use zoom in/out, use custom views, split/freeze panes, display repeating row and columns titles on multipage, setup the page using margins, orientation, paper size, scaling, page breaks, header, footer and print sheets using scaling and print area. An add-in lesson on saving and sending Excel file as email/attachment/pdf/fax. Learn the trick to enter data on different lines in the same cell and shift between different sheets in Excel. Some cool information on how Excel can be used to create art, games and puzzles. We take our Excel course to the next level by learning charts, pivot table and chart, sparklines and objects. Learn how to add/edit/delete charts, modify the data/elements of chart, use different layouts and styles, use chart sheet, add pivot tables to your sheets to present your data graphically, add/edit/remove pivot charts, manipulate options and style, add more elements like sparkline charts, pictures, images, clipart, shapes, textboxes, win/loss chart types, show/hide data markers, create pivot table from single/multiple sources. Learn how to work with complex data, drawbacks of pivot table and how you can overcome them, lock/unlock cell and customizing quick access toolbar. We throw in some bonus tips for you like locking a cell, using functions to change case and best practices like adding table of contents. Our last level of the course will teach you how to use tools of what-if analysis like goal seek, scenario manager and data table to analyse data in the sheets. A step-by-step guide to use goal seek, requirements of goal seek, meaning of scenarios, use scenario manager, create and display scenarios, steps to use data tables, comparison between data table and regular excel data and optimize performance by improving design and data. Bonus lessons on using Excel online/offline help, using flash fill, building scenarios from multiple sources and finally, a summary of shortcuts.